Subsequent remarks were just as pointed, and particularly so with revelations as to the potency of psychotropics employed in the name of mind control. 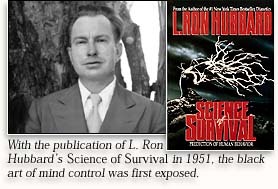 “Now, not to scare you but to inform you,” read a 1955 LRH bulletin to professional Scientologists, “psychiatry has armed itself with several new drugs. One of these, LSD, has the total goal of driving persons insane for fifteen to twenty-five hours.” That a full decade would pass before LSD became anything approaching a headline drug, much less the dark and mythic potion of the late 1960s, is once more significant; for yet again we find an LRH warning well in advance of general alarms. But what matters here, and what even Ron could not have anticipated, was the eventual psychedelic leakage into the cultural mainstream. If the story has been told, the critical details are still worth repeating. Among other celebrated champions of psychedelia to receive a first taste of “acid” through CIA-sponsored testing facilities was Doors of Perception author Aldous Huxley, Grateful Dead lyricist Robert Hunter, counterculture novelist Ken Kesey and LSD high priest Richard Alpert. Then again, one finds an Agency hand in the psychedelicizing of Henry Luce—who, in turn, enticed millions with hallucinogenic spreads in Life magazine and so inspired none other than Timothy Leary to set out in search (literally) of the “magic mushroom.” Finally, let us not forget what United States agency first enlisted Eli Lilly to synthesize lysergic acid for mass production and—lest the point has been missed—who first coined the word “trip” to describe the hallucinogenic experience. Beyond the mid-1960s, the irony runs even deeper with what amounted to an Agency listening post in the psychedelic principality of San Francisco’s Haight-Ashbury—where, among other substances supplied by Agency contract psychiatrist Louis “Jolly” West, unwitting flower children were systematically reduced to hysterics with doses of a super-psychedelic BZ. (BZ was the same agent, incidentally, later used with such equally devastating effects on Viet Cong irregulars by members of the First Cavalry Airmobile.) 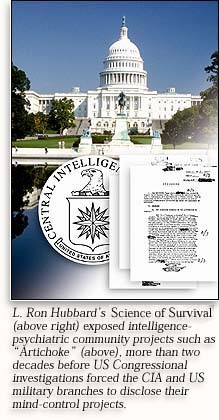 Meanwhile Agency analysts at the Rand Corporation in Santa Monica contemplated the socio-political repercussions of four million American youths on LSD, even as more than 7 percent of all American soldiers returning from Vietnamese combat zones suffered from addiction to heroin— grown, processed and shipped into Saigon by Agency-backed syndicates.